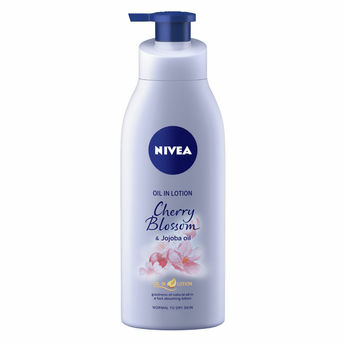 Treat your senses and get the indulgent care and all the benefits of an oil, but in the form of a fast absorbing lotion, with the Nivea Oil in Lotion Cherry Blossom & Jojoba Oil range. About the Brand: A brand trusted universally, Nivea is a leading international skin care company that brings to you innovative skin care and cosmetic products. Nivea understands skin like no one and they are known for their specially formulated skin products for different skin types, that cleanse, nourish and protects the skin while keeping it radiant and beautiful. Explore the entire range of Lotions & Creams available on Nykaa. Shop more Nivea products here.Alternatively, you can also find many more products from the Nivea Oil In Lotion Cherry Blossom & Jojoba Oil range. Explore the entire range of Lotions & Creams available on Nykaa. Shop more Nivea products here.You can browse through the complete world of Nivea Lotions & Creams .Alternatively, you can also find many more products from the Nivea Oil In Lotion Cherry Blossom & Jojoba Oil range.